The Airquest PHR5 single-phase heat pump small packaged product provides remarkable comfort and efficiency. Now, it also offers an advanced dehumidification option with a 20% reduction in indoor airflow for both low- and high-stage cooling. That's COOL! If you have customers in humid climates who have been searching for a high-efficiency small packaged product that can provide state-of-the-art dehumidification, these new PHR5 2- to 5-ton heat pump SPPs may be the ideal HVAC solution. 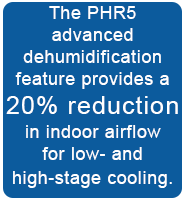 Advanced dehumidification feature is currently offered as a Factory Installed Option on existing PHR5 models. Engineers designed the new PHR5 heat pump SPPs for improved dehumidification. As a result, there is an increase in the wire size on these new models. The maximum circuit breaker size is the same when compared to the current standard model without the advanced dehumidification option. Please refer to the chart below for additional details. Click here to download the Product Specifications Sheet for the PHR5 model with advanced dehumidification. Click here to download Installation Instructions for these new units. Achieving 15 SEER efficiency with a 20% reduction in indoor airflow makes these new Airquest PHR5 SPP units a great option for clients living in humid areas. 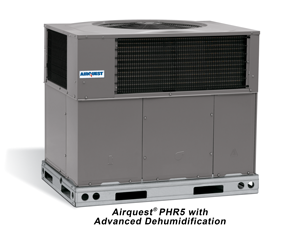 If you are looking for an energy-saving small packaged model that provides advanced dehumidification, the Airquest PHR5 single-phase heat pump SPP offers all that and more! 1 ENERGY STAR is a registered trademark of the U.S. Environmental Protection Agency. Many models are ENERGY STAR qualified. Proper sizing and installation of equipment is critical to achieve optimal performance. Split system heat pumps must be matched with the appropriate coil components to meet ENERGY STAR criteria. 2 Timely registration required for 10-year parts limited warranty and lifetime heat exchanger limited warranty. Limited warranty period is 5 years for parts and 20 years for heat exchanger if not registered within 90 days of installation. Jurisdictions where warranty benefits cannot be conditioned on registration will receive the registered limited warranty periods. Please see warranty certificate for further details and restrictions.